Jordan Brand is famous for their men’s shoes, but this Holiday Season, they are expected to be make a wave in the women’s apparel market with the release of two cool shoes. This Holiday season, the famous Air Jordan 1 will be released in Black / Red & Purple / Turquoise colourways and is dubbed as the Air Jordan 1 Phat GS. Both are expected to be a hit in the market so make sure that you’ll grab a pair! 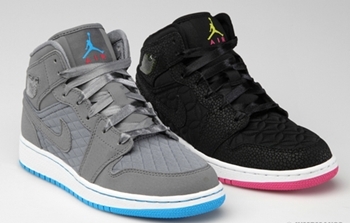 Air Jordan 1 Phat for Women Coming Soon! Air Jordan 1 Phat “Carbon Fiber” Black Coming Out!